A powered subwoofer enclosure takes the math out of mating a sub and amp with an box. A loaded enclosure is truly a "plug-n-play" system which means you get the sub, box, and a built-in amp in one convenient package. 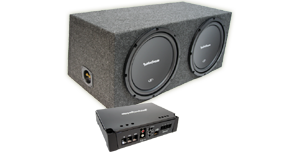 These packages have been tuned, tested, and are certified to provide the correct level of power and performance for all the included components.bBrowse our complete selection of Amplified Subwoofer Boxes only here HalfPriceCarAudio.com online shop!